Sterling Silver Amethyst & Pearl Post Earrings Each stone is hand set and slightly unique. You are one of a kind, so why not wear, jewelry that is too? settings. The earrings rest on sterling silver posts, securing with friction backs. These earrings are a thoughtful gift for the February birthday girl. Gold over Silver Multi-Gemstone Earrings Genuine Tiger's Eye, Black Onyx, Rose Quartz, and Amethyst are utilized to create this colorful assortment to your accessory collection. Earring metal is 14kt gold over sterling silver, and the closure is a fish hook. Lesa Michelle Stainless Steel Snowflake Stud Earring Rose Imitated Plating Lesa Michelle is an excellent designer, specializing in Sterling Silver and Stainless Steel. Lesa Michelle's inspiration comes from all over the world including countries like Italy & India. She focuses mainly on a clean, elegant look that ranges from ladies jewelry, men's and even younger customers as well. Lesa Michelle's promise is to always strive for elegance as well as high quality goods to appeal to every customer. post and friction backs. Total gem weight: 1.6ct. 18K Gold Tri Color Satin Dangle Earrings by Silver Speck Sleek and slender Tri Color strands dangle attractively in these Beautiful Chandelier Earrings. Sterling Silver 3 Carat Amethyst & Diamond Accent Teardrop Earrings These elegant earrings feature a teardrop amethyst stone which dangles below a smaller round stone at the post. A genuine diamond is set between these two stones. These stones are set in sterling silver. It is your good fortune ? and testament to your impeccable taste in jewelry ? 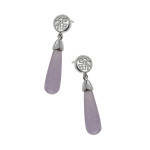 to wear these beautiful purple jade earrings. Crafted of shining sterling silver, each features an elongated drop of pale purple jade, anchored by a kanji symbol for "good fortune." Sterling silver setting and post.